What is that – a flower spike? Could it be? It is! My Clivia is blooming! This was a year for miracles in the garden. Not only did the Hoya I’d tended for 30 years bloom for the very first time this spring – it did it three more times in succession over the summer! 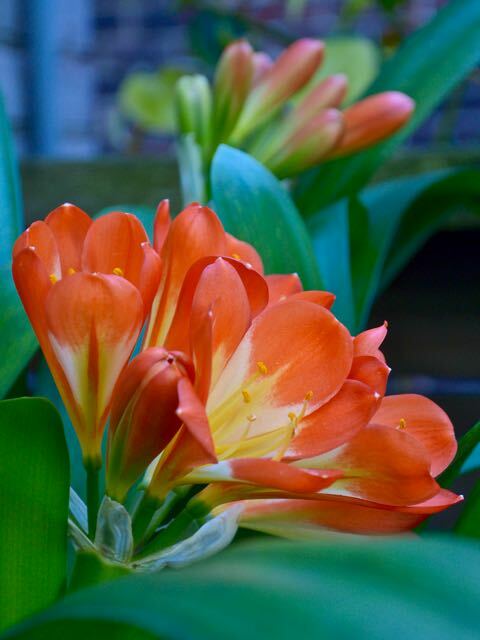 And the Clivia I wrote about two years ago – suspecting the plants were virusy – put out two flower spikes this summer. What did I do right? I have no idea. Perhaps fed it a bit more often? It certainly didn’t get the cold spell it likes between October and February – which is apparently why it bloomed in June and not March, as it should. Who cares! By blooming, it has given me hope. Perhaps I’ll figure out a way to chill it. Perhaps I have a sister with an unheated sun porch. Or perhaps I’ll actually follow these detailed care instructions from CliviaUSA.com. And maybe I’ll have even better luck (and more to be grateful for) next time. 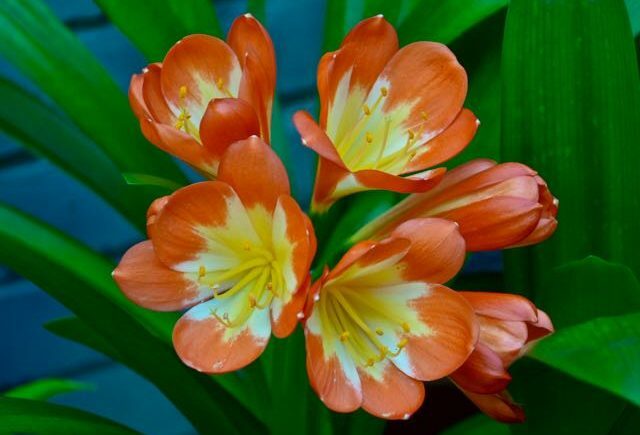 My friend Veronica tells me the secret with clivias is to ignore them. Perhaps that’s what I did right? 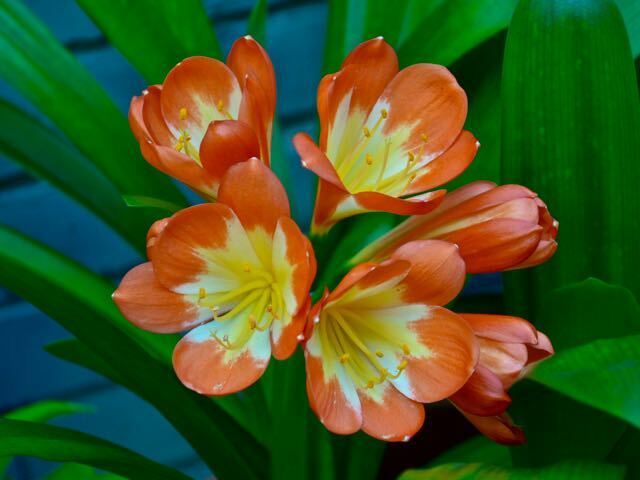 I have 3 clivia and they always bloom in the summertime. I don't give them exposure to any cold, I put them outside as soon as the leaves on the trees are out and put them in my shady back garden. They bloom in mid-July. I repot them in Sept. and bring them inside where they are exposed to lower light. I leave the seed heads on and I water them once a week. I cut the seed heads off in May and repeat the cycle. They always bloom! Hi, Duncan and Claudia, It's heartening to know that even doing it "wrong" is doing okay. As our dad used to say, "Anything worth doing is worth doing badly." Thanks for sharing your experience! Last spring mine rebloomed for the first time since I bought it many years ago. I had put it into the basement over the winter and forgotten it. It had not been watered at all in that time. It got only the light from the overhead fluorescent and other lights I leave on on the time…but it was still in a low light situation. It put out three lovely flower stalks. I'm trying to repeat the treatment this year. 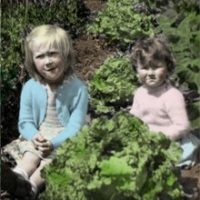 Helen on Toronto Gardener’s Source Ebook. We’re excited. Kathy from Cold Climate Gardening on Toronto Gardener’s Source Ebook. We’re excited. Kate Middleton on Toronto Gardener’s Source Ebook. We’re excited.